The American expedition used camels to haul two metal boats across Galilee to the Sea of Galilee. Then they ran the rapids of the Jordan River down to the Dead Sea. • Forging alliances with a Bedouin sheik and a Hashemite Sharif, thus turning potential enemies into allies. • Employing camels to haul the expedition’s boats over primitive roads to the Sea of Galilee. Usually, camels were used only as pack animals. America’s 1848 naval expedition created a map of Palestine. Here the historic map is layered over Google Earth. Click on the map to see a larger version on a separate page. • Navigating twenty plus rapids of the uncharted Jordan River. • Deflecting a query by a Bedouin chieftain about possible American support of a Bedouin revolt against the Ottomans. • Arriving at the Dead Sea in the middle of a storm that threatened to swamp the boats. Lynch’s quick instructions saved the boats and crews. • Sounded the depth of the sea, collected scientific samples and mapped the contours of the shoreline. 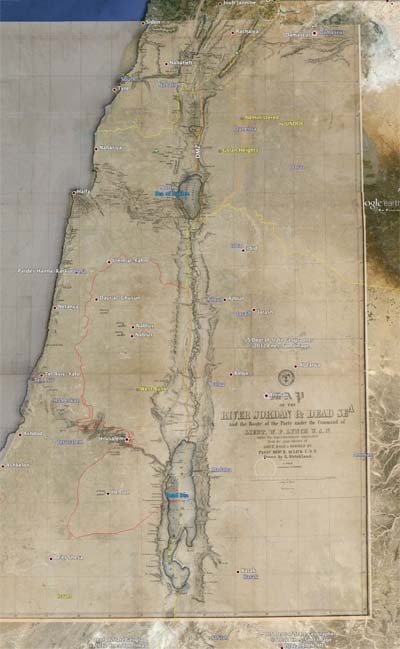 The maps created by the expedition are still referenced today for comparison to diminished water level of today’s Dead Sea. • Touring holy sites in Jerusalem and its vicinity. Lynch’s descriptions of the city and its inhabitants provide a early American assessment of life in Jerusalem.